Brant Goose. Bird Watching Brant Geese. Description - The Brant Goose is similar to the Canada Goose but is smaller with a shorter neck and is darker, lacking the white cheek patches. The colour is dark brown above with a black head and neck; the neck has a white collar. The west coast birds have a darker belly than those of the east and were once considered a separate species. A low, guttural "ruk-ruk" distinguishes the call. Distribution - This species breeds in coastal Alaska and the Canadian Arctic and winters along the Pacific coasts south to California and the Carolinas. While breeding, they prefer tundra and coastal islands; winters are spent in salt marshes and estuaries. 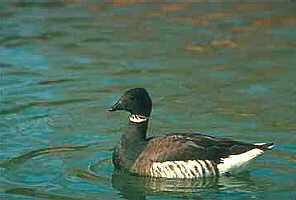 Biology - The Brant Goose feeds mainly on eelgrass and other marine plants so they rarely stray from salt water. They spend the winters in large flocks, feeding on mudflats. Migration takes place in irregular bunches rather than in lines like other geese. 3-5 eggs lay in nests made of moss and down. Although a great number are shot by hunters, the biggest danger is the steady loss of winter habitats to encroaching civilizations.